Chris Malloy has built a hoverbike from motor cycle parts that can fly 173 mph at an altitude of 10,000 feet. Bonus – you don’t even need a pilot’s license because it is classified as an ultralight! It lacks many safety features now, but he plans on adding parachutes and perhaps a covering for the giant fans. 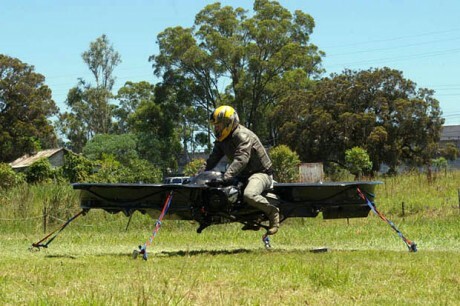 An Australian chap named Chris Malloy has built a hoverbike from motorbike parts, and he claims it can fly at 173 mph at an altitude of 10,000 feet. Those are theoretical figures for the time being because the contraption hasn’t flown too far yet. Malloy bases those outlandish specs on the 231-pound device’s thrust-to-weight ratio. It consists almost solely of a pair of massive propellers powered by an 1,170-cc engine good for 107 horsepower. The fuel tank contains enough juice to give it a range of 92 miles at a cruising speed of 92 mph. The pilot’s right hand controls the thrust of the rotors, while the left adjusts the angle of the control vanes, pitching the nose down or up to move forward or backward. Turning the handlebars turns the machine. Flying Car Watch 2010: Now With Video! Posted in Awesome, Flight, Flying Car! | Comments Off on Flying Car Watch 2010: Now With Video! Earlier this week Weird Things hipped you to a new jet pack that is set to go on sale. Now we are proud to inform you that the dream we’ve all had since seeing our first episode of The Jetsons is set to take flight. 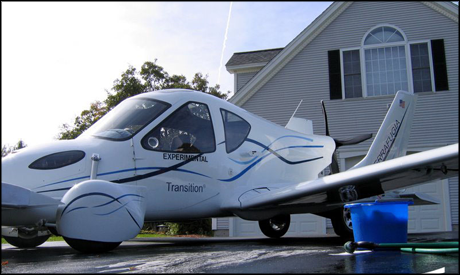 The FAA has created an exception to help Terrafugia’s ‘flying car’ get off the ground. The company was having trouble making the prototype vehicle safe while staying within the weight limits for for a Light Sports Aircraft. This means it will most likely be available for consumers by late 2011. Expect new laws to ban texting-while-flying by 2012. Drivers/Pilots can travel up to 450 miles in the air and enjoy 30 miles per gallon on the ground. 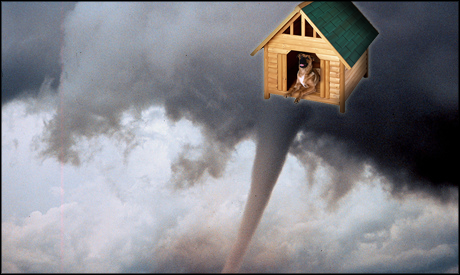 No word on pricing, but you should probably start arranging that third mortgage right now to beat the rush. You are currently browsing the archives for the Flight category.